I’ve been displaying at Rose City Comic Con (RCCC) for the last few years with PortLUG. Every year we talk about maybe doing a collaborative build of some sort, but nothing comes of it but the head scratching. 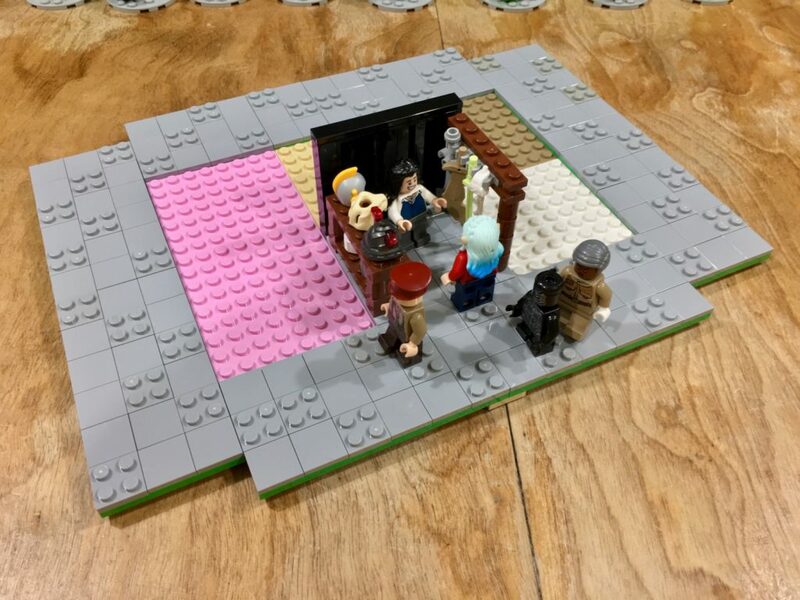 Last year I floated the idea of doing a modular, minifig scale comic convention layout and got a lot of interest. So here is my standard. This is a draft standard. I hope to improve and refine it based on feedback from builders. If you use this standard for your own display, please let me know. I would love to hear about how it works (or didn’t work) for you! The comic conventions that I’ve been to are organized into a grid of booths, which are clustered into islands. The basic goal of this standard is to mimic that layout, with individual builders contributing booths that will then slot into the layout. 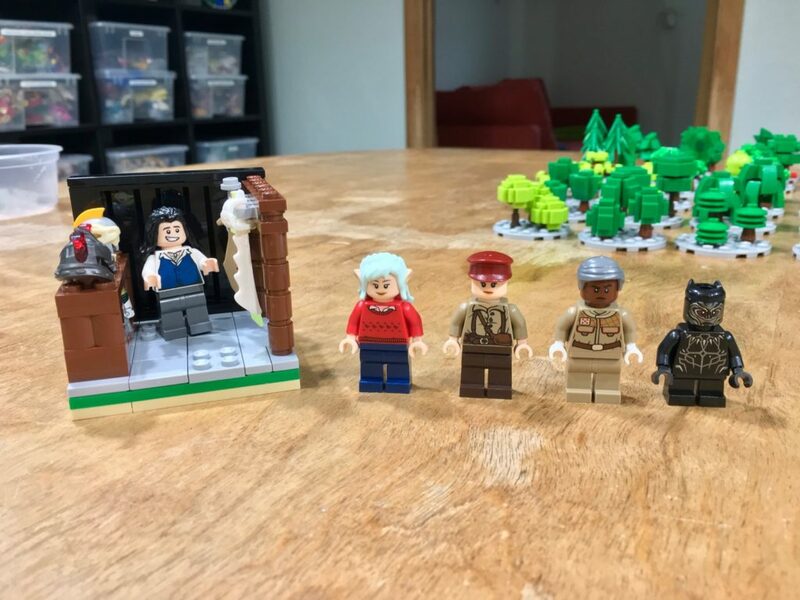 In addition to the booths, there will need to be minifigs to fill up the aisles with convention goers, hopefully approaching the crowds at popular conventions. The basic booth module measures 8×8 studs. Booths can be made larger by connecting 2, 4, or 6 modules together. The base of each booth is three plates thick: a top layer of 2×2 medium stone gray tiles (sub plates or jumpers where things will be attached), the middle layer should be a single plate that is the same size as the booth (8×8, 8×16, or 16×16), and a bottom layer of supporting plates to bring it up to height. At conventions, the booths are separated by black curtains, this is represented by a wall along one or two sides of the booth. This wall should be five bricks high and topped with a layer of black tile. I find that the new corrugated panels work great for this, as they look more like curtains. Booths that are 16×16 do not need curtains. everything should be connected, no loose elements. Beyond these rules, booths should have the details that make sense. Many larger booths have dividers and decorative walls. This is my sample build, a cosplay prop vendor. Comic conventions are crowded. To reflect this, each booth should be accompanied by four convention goers. Since we’re representing actual people, fleshies should be used. Yellow minifigs are only allowed when representing cosplayers (such as someone cosplaying a Simpsons or LEGO character). I highly encourage cosplayer minifigs. I would love to see a wide range of cosplay, from mediocre (a rando wearing an Iron Man helmet) to the pros (think Star Wars cosplay groups). 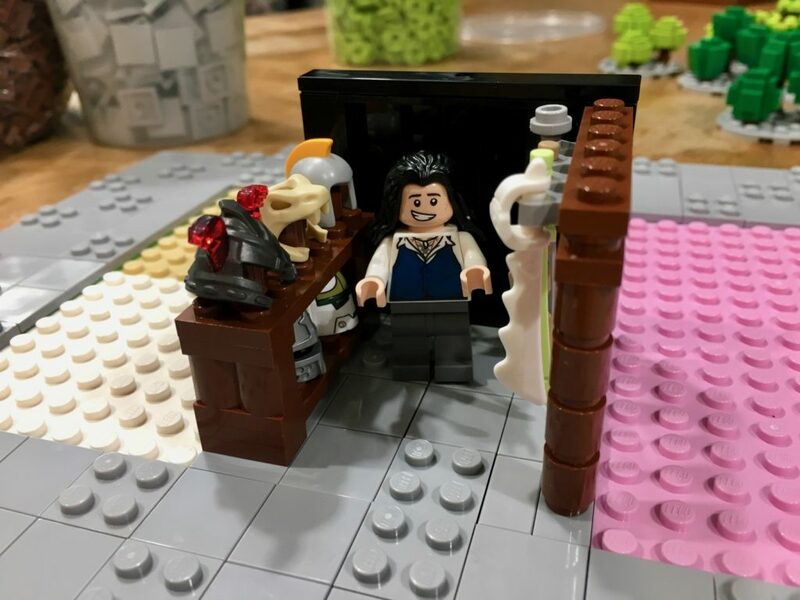 Thanks to the wealth of licensed minifig elements, there is a lot of great opportunity here. These conventions are diverse and our figs should represent that. At least half of your contributed figs should be female and at least one should be non-white. Also think about diverse ages and ability (such as kids and people in wheel chairs). These are my sample convention goers. I have a woman in elf ears with dyed hair, another woman, and a father and son who are cosplaying from their favorite franchises. This standard is a very basic start. I hope to expand it in the future if there is interest. I already have plans to add an artist alley and there are a lot of other cool ideas. Comment with your questions and ideas and help me evolve this standard.